Written on November 28, 2018 . Posted in Blog. If you are in need of some safety-related repairs to your home, specifically your HVAC system, we have a resource you will want to check out. A program put on by the city of Virginia Beach can help you get the money you need to fix safety-related issues in your home. This program is called the VB Housing and Neighborhood Preservation Owner-Occupied Rehabilitation Program.This program assists eligible homeowners repair and replace defective HVAC equipment with the help of grants and loans. The program’s goal is to provide affordable home rehabilitation and repairs to low- and moderate-income homeowners in Virginia Beach. With the loans and grants provided, applicants can afford emergency home repairs in order to remove health and safety hazards, correct certain code violations, and make changes to the home’s exterior. 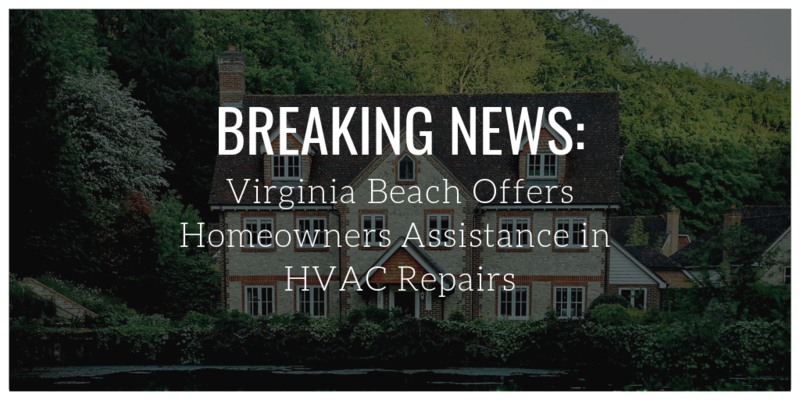 Virginia Beach offers eligible homeowners, dependent upon your level of income and the type of repairs needed, either a grant or an affordable loan (to be paid back over an extended period of time) to fix up their house. These repairs could be to bring your home up to code, to fix health or safety risks, to make your home accessible to physically impaired individuals, and/or to replace defective housing equipment. All of these changes can be made to mobile homes as well. The program offers three types of assistance. Emergency assistance deals with existing or imminent health and/or safety hazards, making necessary changes to allow a physically disabled resident to stay in their home. This assistance provides eligible applicants with an unsecured grant up to $10,000, a secured grant, or a deferred loan. Eligibility requirements an be found here. Home rehabilitation provides assistance to bring your home up to code by correcting select code violations. It comes in the form of a 20-year deferred loan. provides rehabilitation/repairs need to remove any existing safety violations, make exterior repairs, correct code violations or make physical modifications for physically or sensory disabled mobile homeowners. This type of assistance is available to owner-occupied properties in the form of an unsecured grant up to $5,000. We felt that our customers should know about this program because we are well aware that quality HVAC work doesn’t come cheap, but they are also a necessity in maintaining your household. After receiving your grant or loan, you can come to us and our highly-qualified technicians will work with you to help get your home back in shape. If you have questions about the repairs you need and the safety of your home, please call us or email us here! For a complete list of the provided services, program details, and eligibility requirements, visit www.vbgov.com/home-rehab.